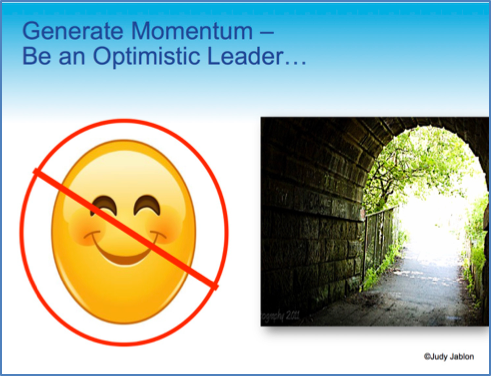 Optimistic Leaders notice effectiveness — what’s working well and why. Effectiveness is not the same as positive — rather it is movement towards a desired result. As you make decisions each day, do you take a moment to think about the outcome? In our work as early learning professionals, it’s imperative that we link our actions and decisions to the impact they will ultimately have on children and families. The big decisions and the little ones that add up to be big ones. Consider this example. Rashid, the director of a program serving infants through preschool, is reflective and focuses on the WHY. He makes it a priority to spend at least two hours each week observing in classrooms. Why? His primary reason is to build a positive climate of support and appreciation. Teachers value being seen and validated for their effective actions. Being seen, the teachers report, gives them energy. They feel valued and recognized for their work. When Rashid takes the time to observe what they do and how it impacts children, they are more motivated to keep doing those actions and reflect on what else they could do to enhance children’s learning. Making this happen takes intentional planning. Rashid spreads the two hours of classroom visits across four days — 2 mornings and 2 afternoons. He has a schedule so that he can rotate when he visits classrooms. He sends out the schedule to teachers on Mondays so that they can anticipate his visits or ask that he reschedule. As a result, teachers are open to talking with Rashid about their practice. Rashid’s action of regular classroom observations and positive feedback directly impacts how teachers think and feel and that results in a climate of reflection and enhanced learning for children. Rashid’s example illustrates how he models for his teachers the power of being reflective. He has reflected on how to shape a positive climate and build momentum for professional growth by intentionally observing and validating teachers’ practices. During our conversation, I validated how he plans intentionally when and how to visit his teachers provides consistent feedback. At first he shrugged and said it wasn’t a big deal. I disagreed. In response he said: I guess it’s hard for me to hear about my own effectiveness. I judge myself harshly and think about what I’m not doing enough of – what I could do better. Be an Optimistic Leader in action! I encourage every educator to take time to notice what you ARE doing effectively and reflect on WHY it matters and WHY it works. In this way you can do these effective actions more and make progress down your path to greater quality for children and families.